Every byte of every file that is on the hard disk, including the boot sector, the operating system, all of your installed programs, and of course, all of your data. In this sense, it is an "image" of all of the data on that hard drive. Every byte of every sector on the hard drive, whether it's currently in use or not. Coincidentally, this also contains all of the data on the drive as well as whatever was in all of the unused sectors. For purposes of our discussions here, the difference doesn't matter. 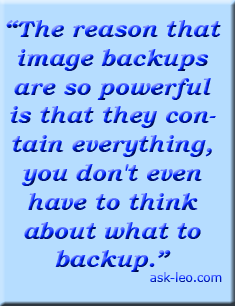 You may hear them referred to as images, clones, or copies, but as long as every bit of data is there, regardless of what it is, I'll simply refer to it as an "image backup." When you take an image backup of your C: drive, you're backing up all of Windows in addition to your data. That means the backup contains Windows as well as all of the machine-specific drivers and settings for that particular machine. The net result is that an image backup of your system drive is optimized so that you can simply restore it back in its entirety and it's ready to go. When the hardware changes, things get ... interesting. Let's assume that the hardware has changed dramatically. Completely different computer from a completely different manufacturer with different ... everything. If you've used the correct backup software to create your image, you'll still want it. You'll reinstall the applications that you use. Perhaps some might be pre-installed, depending on where the machine came from, but the worst case is that you'll need to install or reinstall any that you need from scratch from original installation media. You'll restore your data from the image backup. The scenarios outlined here that involve anything less than restoring the image to a hard disk and booting from it are making a huge assumption. They assume that you can. For example, not all backup software creates images such that you can extract individual files. Sometimes, the only thing that the image can be used for is restoration to the hard drive - sometimes, only the exact same sized hard drive in the exact same machine. The ability to extract individual files from an image backup is critical, in my opinion; it's a requirement of any backup software that I use or recommend. My current recommendation, Macrium Reflect, supports this. An optional approach to that last step is to install a second hard drive, or use an external hard drive, and restore the image backup to that. That way, once running, you can simply access all of the files that it contained. The reason that image backups are so powerful is that they contain everything; you don't even have to think about what to backup. You may not need the entire backup when restoring to a new machine, but you'll still want it for your data files. Because everything that was on the drive is there in the backup. Occasionally, an image backup can be used very close to its optimal way: restore the complete computer directly from the image. Restore the hard disk from the image backup. Reboot into the restored copy of Windows. Windows notices that "a few" things have changed and adjusts itself accordingly. That's perhaps the best-case scenario for new hardware. It might be followed by some partition management if the hard disk that's being restored to is a different size than the original, expanding the restored image to take up all available space. Boot from your Windows installation media. Perform a "repair" install of Windows. Reboot into the restored and fixed copy of Windows. Naturally, that assumes that you have your installation media available. The backup software that you're using specifically supports restoring to different hardware and as it performs the restore, or perhaps after, it attempts to make the necessary adjustments. Assuming that's successful, reboot into the restored and fixed copy of Windows. I don't have any direct experience with this scenario and remain somewhat skeptical that all possible hardware configurations could be handled, but the goal is laudable and promising. As I mentioned above, because an image backup contains everything on your hard drive, it's nearly the perfect safety net. Even if you can't use it for a complete restore of that image by definition, it contains every file on that hard drive. Without needing to remember what to backup, you have everything and can recover your data no matter what. Can I restore the complete backup of one computer onto another and have it work? The concept seems simple: take a system image of one machine, restore it to another, and avoid lengthy setup time. Unfortunately, it's not that simple. As a person versed in imaging Windows 7 for the purpose of deploying to different machines in a business/enterprise environment, you'll want to research what Microsoft calls "sysprep," the "Windows Automated Installation Kit," "Windows Pre Installation Environment" (or "WinPE"), and activation (it's harder to reactivate an non-OEM version of Windows on a different computer, then it is a retail version of Windows). I am afraid that I may get a virus through normal email channels. Therefore I wish to use a different port for incoming and outgoing that will keep the possible virus separate from my main computer. Everything right on the dot - as usual. Imaging has been a way of life for me with the Drive Image being the first functional tool as far as I am concerned. Macrium is fine if you want to pay, the free version is nowhere near as nimble as the Easeus Todo backup, but it might be a matter of taste and opinion. However, fundamental different experience I had is related to Win2k - the MB burned out, I took a completely different machine, restored the image - it would not boot of course! Then I did a dirty re-install and everything was just perfectly fine - OS, all of the programs, all data, simply everything - and still is, while the beast is used as a toy by a bunch of neighborhood kids. My take is, everything will be just fine - as long as you DO have a recent image! Here's a little addendum if you have windows 7 pro or above. Windows own image backup creates a VHD of each drive you select during the image backup. On Pro you can install Windows Virtual PC along with "if you wish" a virtual client called XP Mode from the microsoft site. From the Virtual PC window you can create a new virtual machine using the VHD's created during backup, or you can change the XP Modes settings to add the backup VHD as a second drive. Either way you now have full access to the files. S'pose I take an image backup of my Win XP computer onto an add-on hard drive, and that computer then dies. S'pose I then buy a smart new Win 7 computer, copy what I need, and then take an image backup of that one, too. Can I now use that old XP image as a "Virtual Box", to run old XP software and devices that won't run under Win 7 ? Leo, if I remember correctly, at one time you strongly favored the use of Acronis TrueImage Home backup. Nowadays, you swear by only Macrium Reflect. What has changed? I've used Acronis's TrueImage Home 2010, Nonstop Backup, exclusively for the past two years and have used its image restore function successfully three times. What's not to like? Have a look at my Acronis recommendation page for the latest. Some expensive versions of Acronis True Image have a "universal restore" option. Apparently, it will restore a disk image to dissimilar hardware or even operating systems. I have successfully used it once to migrate between a RAID and non-RAID configuration. If you are upgrading to a new machine(s) or operating system(s), it seems to be the way to go as it only takes about 20-30 minutes!! I recently put in a new larger drive than the one I had. Using the Microsoft 's 7 backup imagae program I transferred all my files to a second hard drive. I used the recovery disc that it is suggested you make. Everything was reproduced exactly to the bigger HD even the size of the partition. The rest of the HD was recorded as "unallocated space." I am a novice and hand my fingers crossed all the time. Another approach is to simply do the installation to the "new" computer and call Microsoft and request permission to transfer the license. Of course calling Microsoft is at times problematic. Direct copying is complicated by different components producing a different Product Activation Hash value. Small changes are overlooked, like a different hard drive or more memory. Establishing the hash value is interesting albeit complicated. I've just done two laptop HDD upgrades using the Windows 7 built-in image file mechanism. I really didn't know what I was doing and tried several unsuccessful methods first, e.g. cloning with Partition Wizard. But when I tried it by the image method, it worked perfectly. In both cases I saved a full hard disk image into an external hard disk, made a system repair CD, left it in the drive and rebooted with the CD while I substituted the bigger hard disks. When it offered the Restore option, I used it. It went without a hitch. Incidentally, in both cases I had multiple operating systems: one XP/W7/W7; one W7/W7 (all Home Premium). In both cases I had separate storage partitions for my data. In both cases I chose to do images of the entire disk, and the procedure restored the whole lot. I then manually expanded the partitions to fulfil my original purpose, i.e. to give the OSs some breathing space and to store more data. I haven't tried Macrium, and it looks like I won't need to do so. But equally I'd be happy to be proved wrong. I have a Dell Latitude E6410 laptop and it came with a small D drive labeled "Reader." I tried to make a Windows 7 image backup but Windows won't let me because the Reader drive is formatted FAT32 and the Windows 7 image backup only handles NTFS formatting. I asked Dell about deleting the Reader drive (it's very tiny) or reformatting it and I was told not to do it. They said the Reader drive contains Dell's diagnostic tools. Too bad, I would like to make an image backup. I think I refered this question before but ..
which is free. I copy the boot drive files  registry. When the drive failed and I replaced it with a bigger alien drive; I reloaded XP from original disks, copied back the whole saved boot files [ overwriting any existing files], copied the old registry - reboot, presto! I agree with John McCurdy - that is an excellent way of moving data to a new computer. I use Macrium Reflect, myself, and highly recommend it. I strongly agree image backups are very powerful and are one of the best if not the best way of backing up your entire system. I currently manage a dozen or so small businesses who which have either a peer to peer or client server network and I am deploying Acronis Backup and Restore 2011 Advanced edition and I understand there is a version that will install an image backup to indifferent hardware. So even if you need to change hardware (purchase new system without OS or change hard drives) you can restore this image to different hardware. Yet to test this out in my labs. My question is the same as Peggy's (which hasn't been answered). I have a Dell desktop and it has a small hidden partition which is FAT16 and Windows won't image it nor let me deselect it. It is marked Active. Can I make the C drive active and just delete this hidden partition or convert it to NTFS? Most "Acronis" True Image Programs will restore a BackUp Image to completely Different Hardware also "Paragon" Backup Programs also offer restore to different hardware option. I.ve been using True Image products for 10 and Recommend them, but "Paragon" products I've also had Good experiences with.